The winter that wouldn’t end has ended, at least for us here on the west side of the Cascades. A winter like those of my childhood, one that surely has made us wake up and take notice. It’s been a while since we had such a winter that stretched from early December to the end of February. We had plenty of firewood and hay which are the big, money-in-the-bank farmstead worries that keep me up at night, but the winter garden was toast or actually frozen. When kale dies here in the winter you take notice. Our cool maritime climate is just that, cool, but not so cold. This winter was a different story. 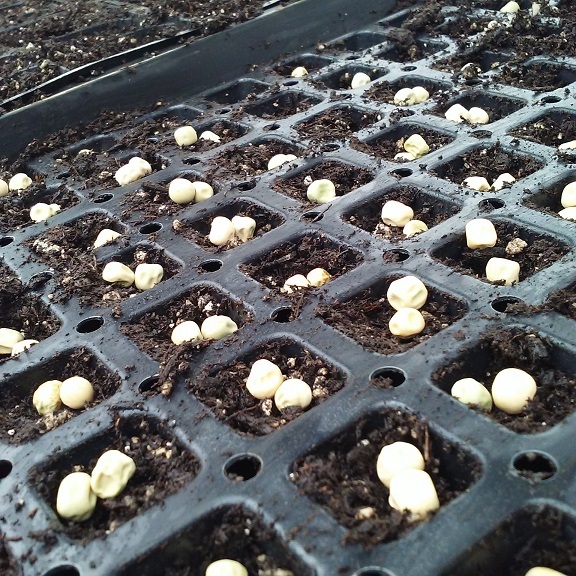 We just started seeding transplants last week, later than some folks in our area and earlier than others. It’s taken me a while to figure out the timing that works for us. I had to learn long ago that using lights and getting an early start just didn’t coincide with our late winter/early spring weather. My plants would do great with the lights and then when they were ready to go outside (because I started them too early) the weather just hadn’t warmed up enough for planting outside or even in the unheated greenhouse. So now I wait until we have enough daylight and start the seeds then. Hurry up and wait just never works out well. I realize some of this won’t apply if you don’t have some sort of greenhouse or outside starting area for your starts. 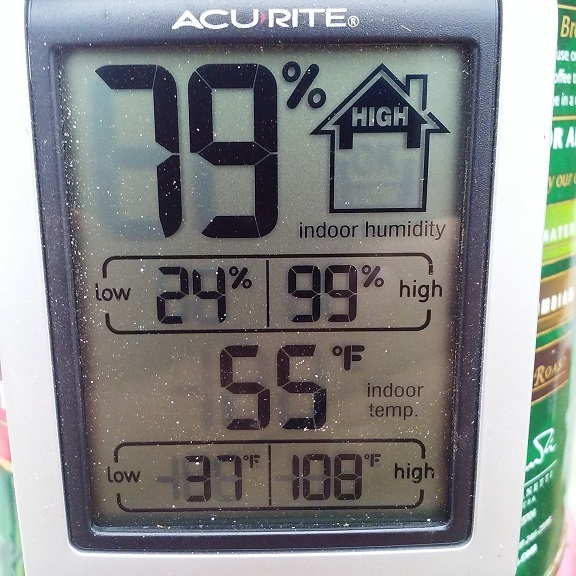 I have tried and failed many times to start my plants in the house and besides the mess, the plants just don’t do well, I think mostly because of the light factor, low humidity and watering needs that exceed my dislike for wet floors etc. But maybe some of my heat mat real estate tips will work. Another thing I have learned over the years too, is that while I might like to be frugal and not spend money for things that I don’t think I need, while making do with re-purposed items, I had to redefine my needs with another template besides frugality and possibly being off-grid. Namely how much time do I really have to fiddle around with cottage cheese containers, dixie cups and manure hot beds in order to start plants. Turns out, not much, plus I don’t have the space, and it’s a $hit ton of work to move plants and replenish your hot bed frequently, I already move enough manure by hand, adding to that chore load is not in my wheelhouse. And it’s more than that, size matters ( I think) to the plant when it comes to containers. Plus, who doesn’t want more bang for their buck, if I am going to plug-in a heat mat, I want to utilize that space as efficiently as possible. That is being frugal. I won’t lie, it is an investment to buy a heat mat or two, trays and inserts to fill them, but it is our year’s supply of food and I’ve had some of my flats and inserts going on twenty years now. So I think streamlining your seed starting is a good way to go. My goal is to start a lot of seeds, and stay out of the store. I am not a casual gardener. I’m in it for the long run. Heat mats – the most common heat mats like these are made for the 1020 trays (10″ x 20″) and come in several sizes depending on your needs. Hydrofarm is the brand I use, and they have lasted for many years as long as I store them flat in the off-season. 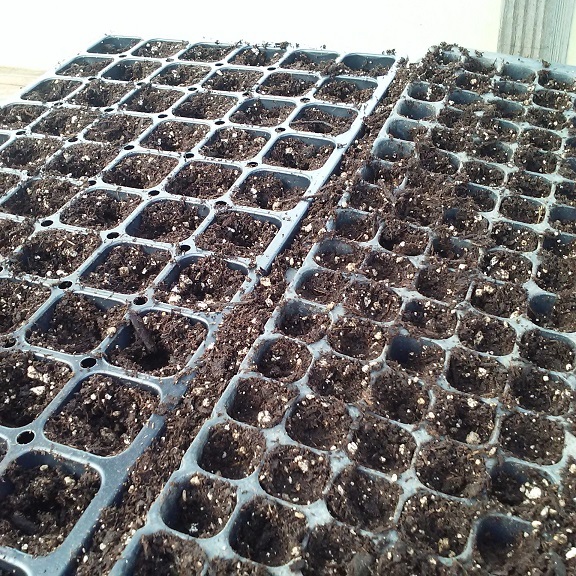 They provide heat to the bottom of the flat, that is best for quick seed germination. Quick is what you want to avoid problems with seeds rotting, fungus attacking, etc. Since the heat mats only raise the temperature to 10 degrees higher than the ambient temperature I need to provide some sort of clear plastic cover to provide a mini-greenhouse effect until the seeds germinate, and I also place the mats on sheets of rigid foam insulation to ensure the flats are getting the full benefit of the heat mat. Remember I am starting these in our unheated greenhouse. If you shop around, you can find better prices online. 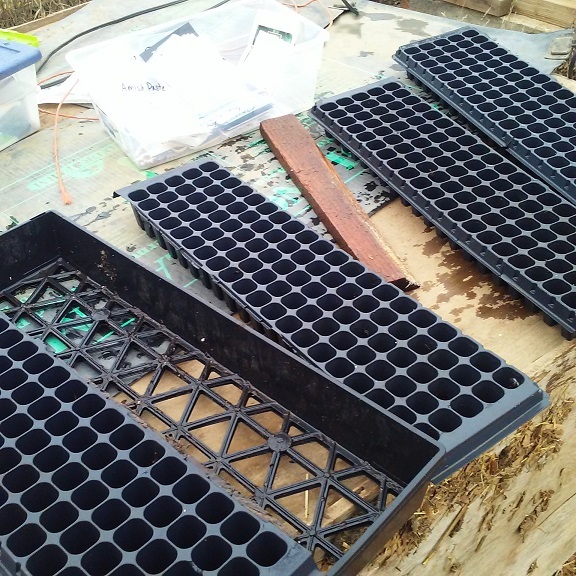 Seedling trays and inserts – I use the 1020 mesh trays sometimes called Daisy trays. You can also buy 1020 trays without drainage slots if you are starting your plants indoors or may want to water from beneath. The tray size is fixed but the inserts come in all sorts of sizes, I use the 200, 72, and 48 the most. This size tray also can house eighteen 3.5″ pots, the size I use for potting up tomatoes. Shown above is my frugal side rearing its head. I don’t always want 200 hundred starts, so I have cut some of my trays in half so I have some homemade 100s in the size want. This leaves the other half of the tray open for a larger size. Confusing? 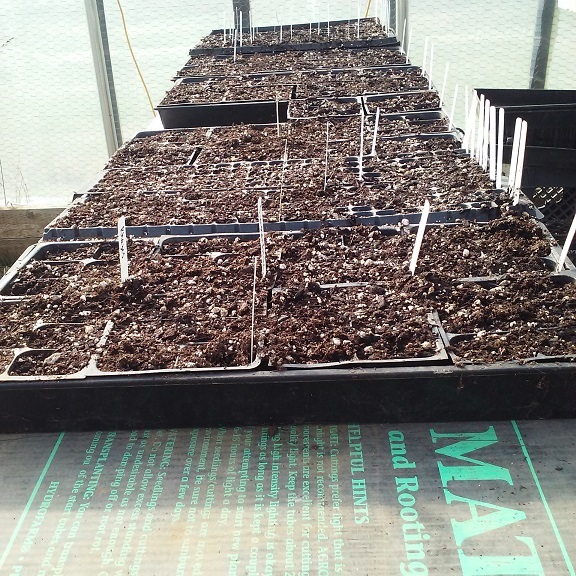 To make efficient use of my heat mats I need to group seeds together that have the same germination times. Slow starters like celeriac, celery and some herbs and flowers may take 3 weeks or more on the heat mat to break the soil, you do not want them in the same insert as something like a tomato or bok choy that takes about 4 or 5 days. Home garden needs might warrant that I plant 50 celeriac, 50 celery with my homemade 100, and then I use 4 six packs to fill the other side of the flat with something like kale which I can then remove as soon as germination takes place, then that open half flat can be used for another succession of any fast growing green or brassica. Note here – brassicas kind of rule Cascadia where I live, so in your area it might be something like okra or … . Essentially, moving my seed starting outdoors to the greenhouse actually gave me more leeway and freedom than one would expect. No mess, and more room for experimenting with new varieties. While the environment is a little less controlled than an indoor setup, many days the heat mats are off due to solar gain, so we are actually using very little power. Always seed more than you think you need, plants die, plans change, and stuff happens. Seeds are cheap insurance for your garden. Chris, I hear you on that, for many years I did dryland, but that requires sooo much space. Two years ago, I invested (the labor savings from not have to spend time hand watering paid for it) in a low pressure drip irrigation system and have been able to consolidate my plantings (and work) by using that system once a week. We have regular rainfall in the non-growing months and pretty much none in the summer. Change is good. Enjoyed the post. Was very interested in reading about how you wrangle with time management vs. keeping costs down. It’s reassuring that even a pro like you has to deal with a learning curve. Unlike where you live, we experienced the warmest winter on record, which means certain nasties will not have died off, making the coming gardening season that much more challenging. Oh, well. For the time being, I’m enjoying the optimism of watching seed starts grow. Happy Spring to all. Karen, oh yes the learning curve, plus only doing this once a year for some things you tend to get a little rusty! So wet and cold this winter. I guess we needed that to jolt us back to reality. I prefer the warm and mild winters we have had the last few years. Thank you for the seed starting tips! I need to get my own seedling set up going. The heat mat on foam is a good idea. i have been trying to stay on top of the weeds in our raised strawberry bed. However, it is hard to compete with quack grass roots! BJQ13, you’re welcome! Oh the dreaded quack grass!! Makes decent pasture but I sure don’t like it when I have to weed it!! Leigh, our hoop house is unheated also, it usually is just as cold inside as out, unless the sun is out of course. Actually the heat mats are okay on the power usage, they are on a separate meter so I know exactly how much the power cost is for them or the chicks when the brooder lights are on. Usually for the month or two we use them, (I have 3, one small for two flats, and two larger for four flats) the bill is usually about $7.00 – $10.00 each month. I turn them off on sunny days, but if you’re not home a timer would work for turning them off on sunny days. That isn’t a lot of money if you consider how much it costs to buy starts, plus I’m sort of a serial transplanter, so I do a lot of starts. 😉 Seeds start so much better with bottom heat compared to just a warm space, the heat mats mimic warm soil. I love this “I’m not a casual gardener” approach. I think I need to take my garden more seriously! Spudlust, I just checked your blog the other day and was sad to see you weren’t blogging 😦 It’s hard, and Instagram has become my happy place. Or actually I blame the phone, too lazy to transfer photos to the computer… Ugh voles, they had a heyday under all the snow cover this winter, tunnels everywhere!!! perhaps if you’re concentrating on instagram there should be a link here that points to there.